Where a low cost pad is required for effective isolation of noise and vibration from equipment with speeds down to the order of 2000 RPM. Typically used on airconditioners, business machines, transformers, pumps, machine tools, cooling towers. Made from prime oil resistant elastomer. Unloaded thickness 10.5 mm. Cross ribbed, non-skid faces which usually eliminate the need for bolting down. May be used in multiple layers with steel or aluminium shim spacers to increase isolation efficiency. Two load ratings available – Standard (red) and Heavy Duty (black). Available in alternative elastomers to special order. Alternative pad mountings available include FLATBACK (neoprene ribbed one side only); and CORKRIB (cork sandwiched between two layers of FLATBACK). Refer Data Sheet CKRIB for details. Standard SHEARFLEX pads will provide effective noise and vibration isolation through a load range 130 to 500 kPa. Recommended load for most applications is 250 to 450 kPa. 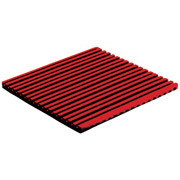 Heavy duty SHEARFLEX Pads have a useful load range of 200 to 750 kPa.